Ham and cheese go together like… Well, you know the song. And when there’s leftover ham to use up, these homemade buttermilk biscuits are the perfect solution! They’re tasty by themselves, or serve them up with a nice warm soup. I love baking biscuits for their sheer ease and flexibility. Combine some simple ingredients and pop them in a hot oven for less than fifteen minutes, and the aroma will make you swoon. 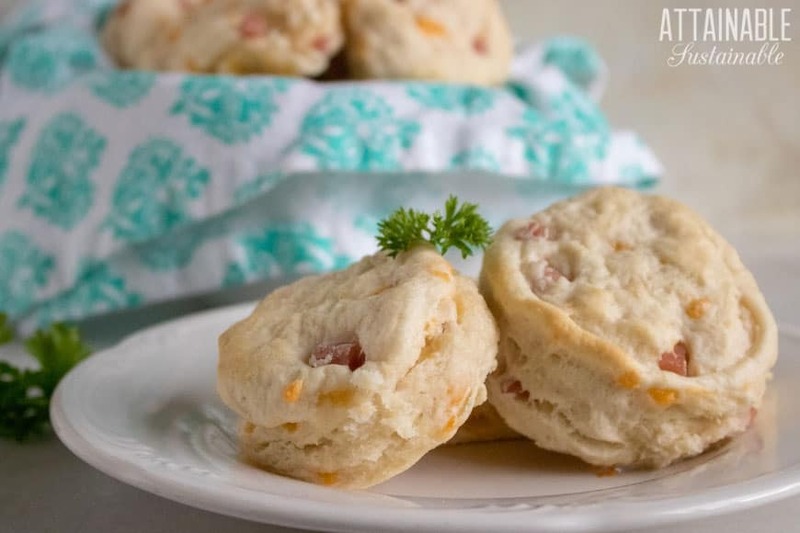 These biscuits are a great way to use up leftover ham bits, and of course, that ham [here’s how to cure your own ham] will add to the aroma! These homemade biscuits call for the usual biscuit ingredients, but the leftover ham and cheese worked into the dough gives them an extra boost of flavor. You can make the beautifully shaped biscuits you see here, or make an easier drop biscuit. This means no rolling the dough. Instead, you’ll scoop the dough instead, then drop it onto a baking sheet. To make drop biscuits, simply increase the amount of buttermilk by 1/2 cup. This will make for a looser dough that’s a bit sticky. Too sticky to roll out, but easy to scoop! You know those savory breakfast egg muffins one might pick up at a famous fast food joint? With the leftover ham and cheese worked into the dough, these buttermilk biscuits have a perfect flavor base to become their own wonderful breakfast muffins. Just cut the biscuit in half, toast it, and top with butter and a fried or poached egg and you’ll have a great breakfast to start the day. When there's leftover ham to use up, these easy homemade buttermilk biscuits are the perfect solution! They're tasty and great with a nice warm soup. Mix dry ingredients. Cut butter into thin slices and then cut it into the flour until pieces of butter are small. Add in the buttermilk slowly and incorporate with flour mixture. Don’t overmix. Sprinkle a small amount of flour on work surface and place dough on top of it. Press down to make flat and then add the ham and cheddar cheese to the top. Knead dough a few times to incorporate the ham and cheese. Press or roll out into ½ inch thickness. Use a biscuit cutter to cut out biscuits. Bake biscuits for 10-12 minutes. Don't want to bother rolling the dough? To make drop biscuits, simply increase the amount of buttermilk by 1/2 cup then scoop the dough out onto a baking sheet. Wow, looks like great? I’ll have to use vinegared sweet milk as I cant afford buttermilk. But I bet itll work just fine with the vinegar acid reacting with the baking soda. Yes, that will certainly work!